A primary school in Shepherd’s Bush has been named the best in the country. Ark Conway is a free school that opened in 2011. “A tiny free school in a poor part of London has achieved the best results in the country, three years after it opened. Every child achieved the expected standard or higher in mathematics at Ark Conway primary academy, the highest in England, and 93 per cent did so in English, which was equalled by one other school. Its results were better than any others among the 15,000 primary schools in England and those prep schools that submit their results to the Department for Education. Among the schools it beat was one of the most highly selective independent prep schools, James Allen’s Girls’ School, which had the third highest results. Damian McBeath, the founding head teacher, said its success was due to strong teaching. Each class has both a teacher and co-teacher, who is a graduate on a teacher training programme, which the school uses instead of classroom assistants. It also uses a maths curriculum adapted from Singapore, which ensures that children master each concept before moving to the next and makes heavy use of pictures and counting blocks that help children to visualise sums or calculations. The local Labour MP Andrew Slaughter tried to thwart its building works. Labour councillors on the Planning Applications Committee tried to prevent it from opening – including the Wormholt and White City Ward councillors. Cllr Colin Aherne especially asked that his opposition to the school should be named. 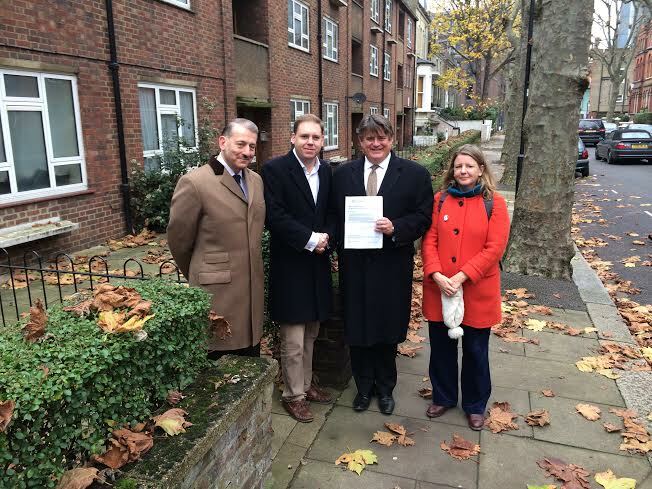 The Deputy Mayor for Policing & Crime, Stephen Greenhalgh, has intervened to stop the sale of properties in 17-39 Broadmead on Auriol Road in Hammersmith and ensure residents can remain in their homes. The Deputy Mayor visited Broadmead today at the invitation of local Conservative Party Parliamentary candidate Cllr Charlie Dewhirst to speak with local councillors, Joe Carlebach and Caroline ffiske, and residents who faced the prospect of eviction from their properties, managed by Crown Simmons. The Deputy Mayor has today signed a formal decision to halt the sale process and has introduced new guidelines for how such cases are handled in future. Under the new MOPAC guidance, existing tenanted properties comprising multiple units will only be disposed without affecting existing tenancies to a new owner – such as a housing provider or local authority – who offered the occupants similar or better terms. This now means such residents would not be forced to move out as a result of a sale. The Mayor’s Office for Policing And Crime (MOPAC) owns the MPS estate across London and the Deputy Mayor for Policing & Crime (DMPC) is responsible for decisions around estate changes, closures and disposals. The Property Services Department of the MPS handles all sale, marketing and tenancy matters directly themselves or with estate agents, local authorities and housing providers. “I have stopped the sale process for Broadmead and introduced a new approach so that eviction of long-standing tenants, some of whom are key workers, cannot arise in future. The Metropolitan Police is not a landlord, but it is right that we find new owners for sites like this that can give tenants the security they deserve. 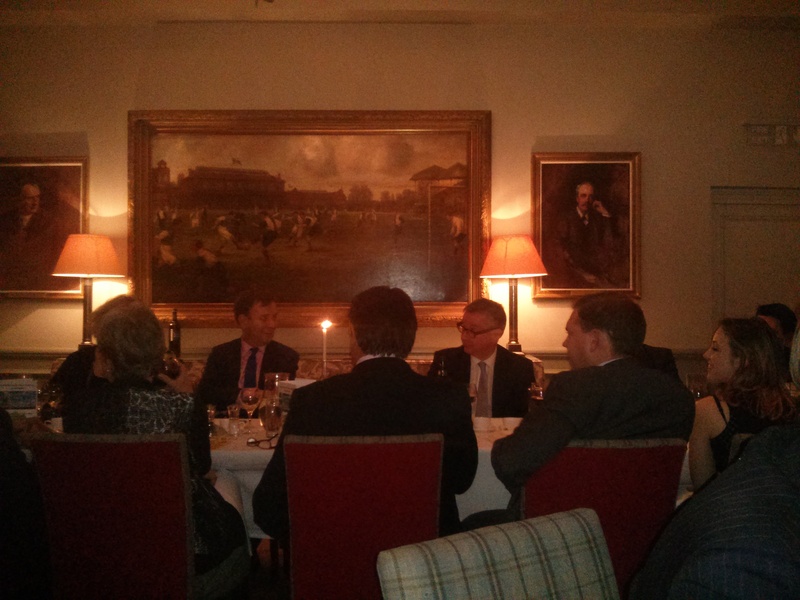 A very enjoyable evening last night at Queens Club where Michael Gove, the Government Chief Whip, was the guest speaker at the Hammersmith Conservatives annual dinner. 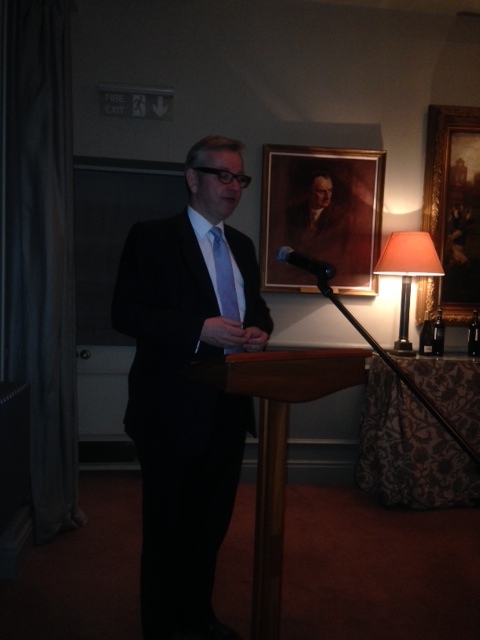 Mr Gove praised the Hammersmith constituency for being home to QPR and the West London Free School. He looked forward to the General Election in May when voters would have the chance to remove the “dishonourable member” Labour MP Andrew Slaughter and elect Cllr Charlie Dewhirst as their new MP – and thus help prevent Ed Miliband getting into Downing Street. Over a hundred supporters were present including Stephen Greenhalgh, the Deputy Mayor for Policing, who was praised for the reduction in crime in the capital. 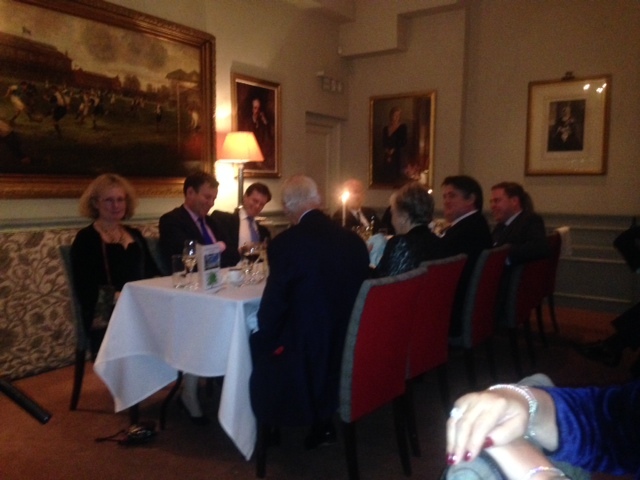 As well as stalwarts there were also some new faces – including parents from some local free schools. This proved quite an emotional part of the evening. They wanted to thank Mr Gove personally for introducing this policy when he was Education Secretary – with the transformational difference it made to the life chances of their children. 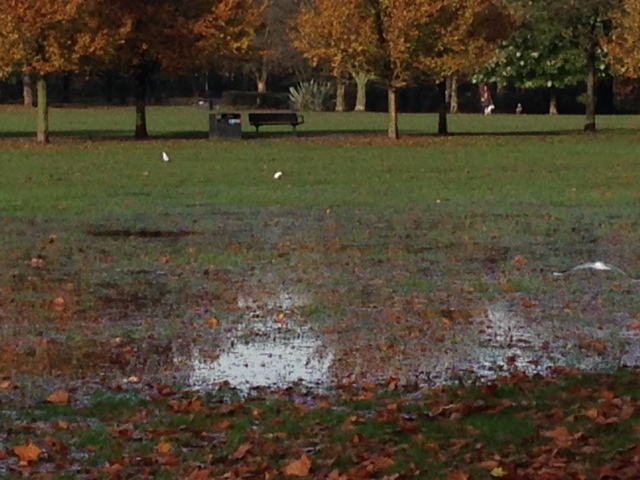 Ask me my three main priorities for Ravenscourt Park and I tell you: drainage, drainage, drainage. This photograph I took on Monday shows the extent of the problem. There will a Festive Market on North End Road on Saturday December 6th. It will be pedestrianised up to Lillie Road. The Conservative Group on the London Assembly have just produced an interesting report on markets. It says those that are independently owned tend to do better than those under local authority ownership. Labour took control of Hammersmith and Fulham Council in May having made an “early pledge” to “block” the NHS planned changes at Charing Cross Hospital. Six months on Labour have given no clue as to how or when they implement their promise. 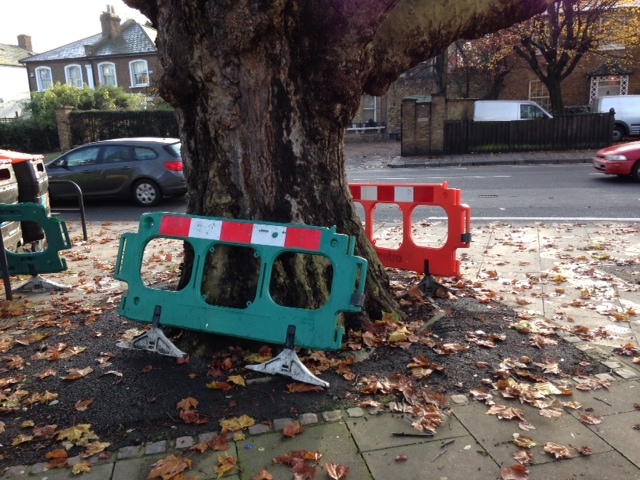 I went on a “grot spotting” tour of Ravenscourt Park Ward this morning with Cllr Charlie Dewhirst and Cllr Lucy Ivimy. A long list of matters to pursue has resulted – including in the Park itself as well as Flora Gardens, Derwent Court and the Dalling Road Open Space. One problem that seems to be cropping up a lot is of road barriers randomly scattered around the place serving no apparent purpose. 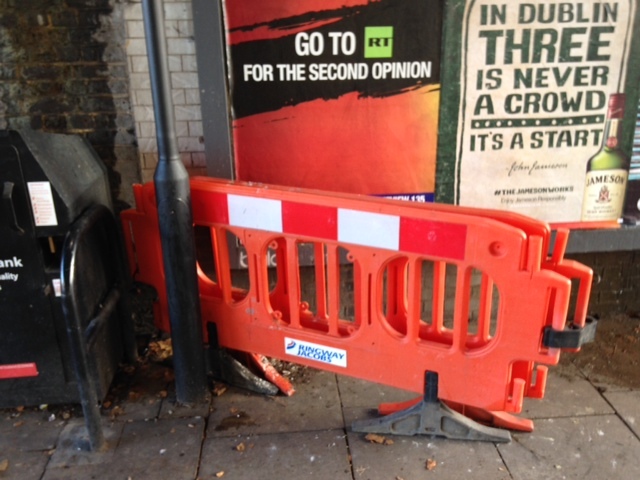 A couple of examples are below – one outside Stamford Brook Tube, another at Starch Green. I have asked the Highways Department what is going on.